Can you believe that it will be December on Saturday?? Are your Christmas festivities starting this weekend or next weekend? Time for some awkward and awesomeness! Lady in checkout line that was beyond rude to every single person around her. Honey, what are you going to be like by mid-December??? Going out in public with that long size sticker down the leg of your pants. You know the one that repeats your pants size about 10 times down your leg. What is it with jeans these day? Buy the size you normally wear and they fit pretty snug and never stretch out. Buy the next size up and they fit perfectly only to be stretched out to 2 sizes bigger by the end of the day. Starting a TV show and then suddenly finding yourself waking up at the end of it. Waiting around while getting a pedicure because the nail color you want is being used by someone else and they only have the one bottle. Son1 is now an official ski instructor! Two weeks ago I started helping out once a week in an inner city kindergarten classroom. Finding the perfect statement necklace for the holidays and it didn't even break the bank. I must be having a thing for black this week although this outfit certainly has a burst of color. I got this fabulous motorcycle jacket when I went to explore the JCPenny concept store a month or so ago. It was finally cold enough to wear it today. So let's hear your awkward or awesome moments this week. That is a great jacket! I always forget about JCPenney. When I do make it in there, I am always pleasantly surprised. Best thing about the cheesy movies? I love purple mixed with black. So pretty. I always forget to take off those size stickers. So awkward! Oh, I love the color of your pants! Love that jacket! Awkward- getting a big tree and not enough ornaments. Awesome- finding two statement necklaces on clearance for only $7 each! 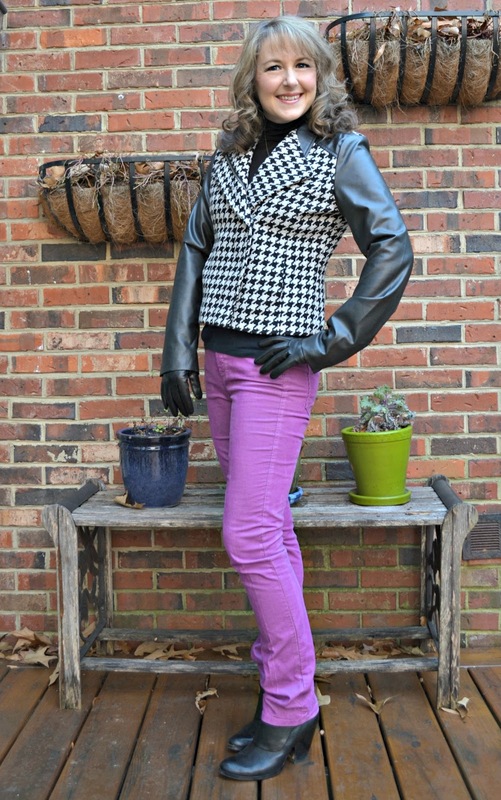 What a cool outfit! You are so cute! My awkward moment? I cried over a stupid & trivial thing today at the office... I blamed it on my hormones! How lame is that? Your jacket is so awesome! ahhh I totally love it. and the hallmark movies...oh my. they are so bad, and so good. Brett! sorry! had to laugh at the pant sticker on your pants. sorry, really but toooooo funny. glad about your helping at a school. good on ya! and yes i have noticed the pant size thing even at the thrift stores. wow! Hey Brett! Love those jeans with that jacket, tough and girly. I'm OD'ing on the cheesy Christmas movies with my two daughters. We just can't get enough! Even hubby is getting sucked into them. TGIF! I'm enjoying the old Peanuts holiday cartoons that are on the airways right now - waiting for the Grinch next! 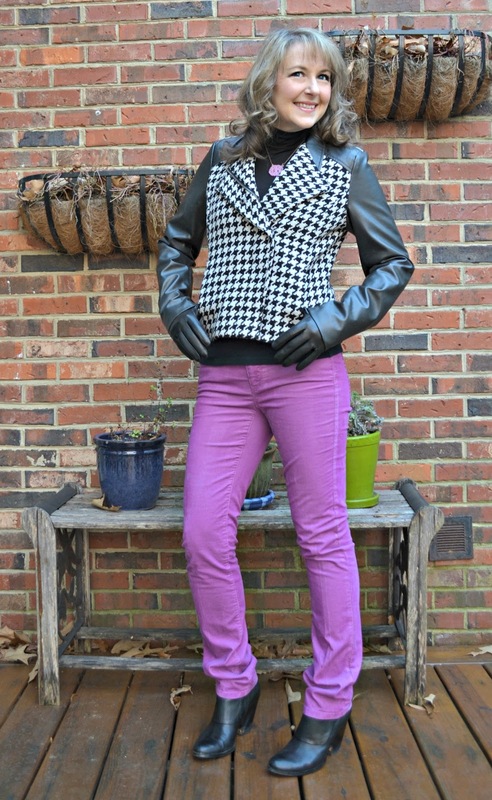 I love that houndstooth jacket and those pretty purple cords!! And YES to the pants problem. That keeps happening to me, especially with colored jeans. Old Navy, I'm talking to you. I like the way you layered here Brett. The leather is so classic! So funny about the grumpy lady in line. People get themselves into such a tizzy at this time of year. 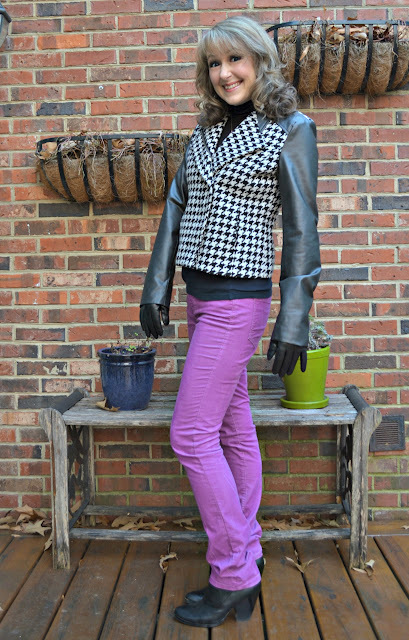 It's ridiculous..
What an awesome houndstooth moto jacket!